Tomorrowland is a dense, fascinating work of art, with a story that expands far beyond the film and which contains a variety of ideas. And while I had every intention of analyzing the film after I saw its first trailer, I felt further compelled to defend and dissect it when, upon leaving the theater after seeing it for the first time, I overheard a group of teenage boys talking about how it was the “worst thing they’d ever seen.” I don’t expect to change anyone’s mind with this, especially not an anonymous group of teenagers, but I feel like the passion and craftsmanship that went into Tomorrowland deserves an equal amount of passion and diligence in considering the film. It wouldn’t be fair to the film or its creators to let it simply slide on by barely noticed and quickly dismissed, particularly when it has such potential to inspire and challenge our preconceptions. Also, on a personal level, Tomorrowland has been one of the most meaningful and fulfilling movies I have ever seen, quickly jumping to a spot on my all time favorites list. People often talk about how a particular work of art, be it a movie, a book, or a song, changed their life. Well Tomorrowland didn’t change my life, it confirmed it. It was the rare film that felt like it was made specifically for me, although I’m sure I’m not the only one who feels that way. My hope is not to convince you that Tomorrowland is the greatest thing ever, nor to make you feel what I felt, but simply that you might take a second look at a film you might otherwise have cast aside. Tomorrowland may not be for everyone, but it could inspire anyone. To really dive into Tomorrowland, and why it’s so special both to me personally and in the larger film landscape, we first have to take a look at the story of Tomorrowland, which begins long before the events of the film and spans the film, a novel, an app, interviews, and an alternate reality game. (Spoilers for the film and the book from here on.) It all starts at the 1889 World’s Fair in Paris, when four men, Thomas Edison, Nikola Tesla, Jules Verne, and Gustave Eiffel met at the top of the Eiffel Tower and conceived of an organization in which the world’s greatest thinkers, dreamers, and visionaries would work together for the advancement of the human race, free from government or corporate influence, with a focus on creations that would improve humanity. They named this group Plus Ultra, a play on the Latin phrase “non plus ultra,” loosely trasnlated “nothing further beyond” implying that we’d reached our limits as a species. Over the following years, two major things led to the creation of Tomorrowland. First was the realization that seemingly all of the inventions for which Plus Ultra was responsible were corrupted by corporate and governmental influence into tools for destruction or subjugation. Airplanes were turned into weapons of war, automobiles led to tanks, and atomic energy eventually became the ultimate destructive force on the planet. Second was the discovery of another world accessible via wormhole. This other world, actually a distant planet, was like a new Earth free from the violent forces of our own planet, upon which Plus Ultra envisioned a fresh start. In the early days, soon after the turn of the century, the only “easy” way to access Tomorrowland was by tearing a hole in spacetime via atomic weapons, but their use was stopped by Plus Ultra member Albert Einstein, who saw the damage these weapons were doing to the planet. This takes us generally up to the start of the prequel novel Before Tomorrowland. In the novel, we learn that Tesla, financially backed by Howard Hughes, has built a safer, non-hazardous method of transportation to Tomorrowland known as the Grid, and we join the story at the 1939 New York World’s Fair, at which Plus Ultra hopes to recruit dreamers and visionaries to help flesh out the construction and design of a futuristic city on this distant world which will be the heart of a new civilization, which they hope to eventually reveal to the public. Their plans are derailed by the novel’s end by a former member who has been chasing the dream of immortality. He sought to transfer his consciousness into a robotic body ten years previously but was thwarted, and has now joined forces with a rogue band of Nazis in a quest both for revenge and to fulfill his vision. By the book’s end, the Grid has been destroyed and Plus Ultra’s recruitment has been put on hold until they can find another way into Tomorrowland. In the novel’s epilogue we see Ameilia Earhart eventually find her way back to Tomorrowland in 1952, with a lot of work still to do to get Plus Ultra’s plans back on track. The story picks back up in the opening scenes of the film, set at the 1964 World’s fair. 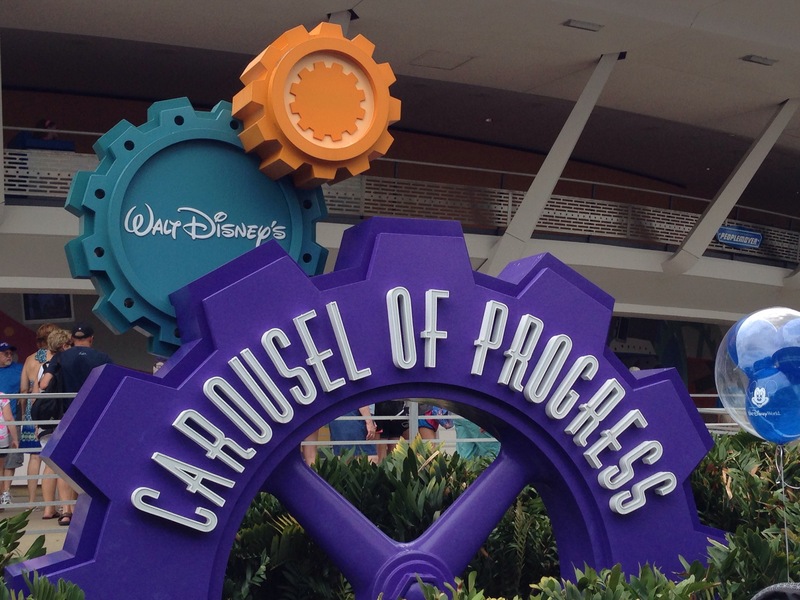 Plus Ultra is working to rebuild Tomorrowland, with the goal of unveiling it fully to the public in 20 years. They’re recruiting members again via an invention contest at the World’s Fair, where those selected are taken to Tomorrowland, now under construction, via a hidden passage in the “it’s a small world” ride activated by wearing a secret pin. Young Frank Walker is given a pin and directed to the ride by Athena, a young robot girl directed with finding people who meet Plus Ultra’s search criteria and recruiting them. Frank sneaks in (as he wasn’t chosen by Tomorrowland’s governor, David Nix), and eventually impresses Plus Ultra enough with his rocket pack that he’s allowed to stay. It’s here that things get a little murkier, but we can piece together the general sequence of events from hints, clues, and suggestions in the film. At some point between 1964 and 1984 Frank invents the Monitor, a device which uses tachyons to allow people in Tomorrowland to keep an eye on what’s happening on Earth. As a byproduct of the faster-than-light nature of tachyons, the Monitor also allows them to see into the future and the past. We know that Frank eventually uses this information to calculate the probability of, and countdown to, the end of the world. Frank is then kicked out of Tomorrowland by Governor Nix for “creating something he shouldn’t have,” which we can only assume is the Monitor. Tomorrowland is sealed off, the plan to reveal it to the public is cancelled, and Athena is also banished, having stolen a box of pins designed to show a new generation of dreamers the promise of Tomorrowland. And at some point in that twenty year span, young Frank fell in love with Athena, only to have his heart broken upon learning she’s a robot, losing his capacity to hope and love in the process. Enter Casey Newton, young, idealistic NASA lauchpad demolition equipment saboteur, who is given a pin by Athena and has a vision of Tomorrowland complete with a seat on a rocket being saved specifically for her. After the pin’s demonstration ends, she tries to track down its origins, eventually putting her in touch with Athena, who leads her to Frank. Frank has no interest in helping her find Tomorrowland, and spends his time watching his countdown clock and waiting for the world to end. But when Casey’s defiant optimism causes the probability of destruction to flicker from 100% down to 99.94% his attitude starts to change. They flee to Paris, unlock a hidden rocket underneath the Eiffel Tower, and escape to Tomorrowland, where Nix still rules but has given up on humanity. Casey eventually realizes that the Monitor not only receives images of Earth and its future, but can also transmit, and that Nix has been sending the images of Earth’s impending destruction back to Earth in an effort to scare humanity into changing their path. The opposite has happened, however, and humanity has embraced its own end rather than work towards something better, so he has given them up as a lost cause. Casey, Frank, and Athena work to destroy the monitor, and eventually succeed when Athena sacrifices herself in order to save the day. The story then picks up a year later, with Earth having lived passed its supposed extinction date and Frank and Casey preparing a new team of robots to deliver pins to dreamers around the world, hoping to recruit them for the same idealistic mission that was first envisioned back in 1889 by Eiffel, Verne, Edison, and Tesla. 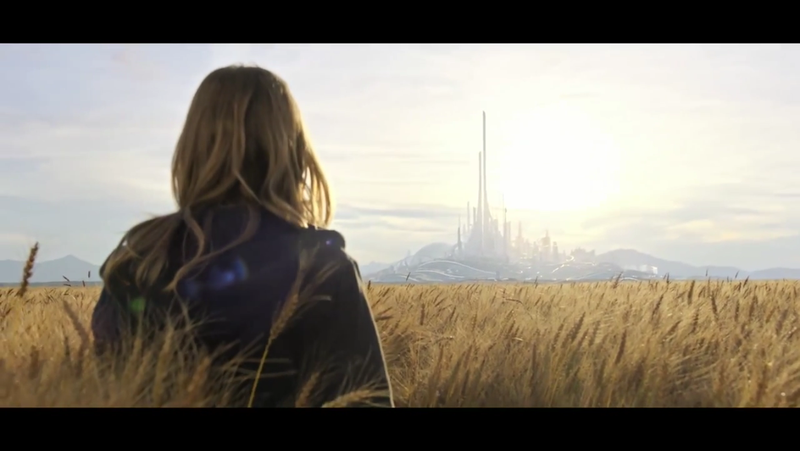 Writers Damon Lindelof and Jeff Jensen certainly have plenty of experience with the kind of complex, mysterious, secret worldbuilding that went into the pre-release hype for Tomorrowland, due to their connections to the show Lost. Lindelof was one of the creators and showrunners of Lost, while Jeff “Doc” Jensen was one of its most devoted fans, writing weekly recaps for Entertainment Weekly which frequently delved into theoretical physics, philosophy, literature, religion, and metaphysics over the course of many pages devoted to each episode. So it’s no surprise that the pair, along with Brad Bird, crafted a world that pulled in historical figures from Verne to Tesla to Einstein to Earhart to Disney, full of wormholes, teleporters, audio animatronics, multiple time periods, and a mysterious society. Even the ARG aspect of the film has ties to the one which ran between seasons of Lost. (Anyone else remember Rachel Blake?) Fans of Disney and original science fiction ate up all of the clues just like people did watching Lost back in the day. However, we all remember the anger and frustration generated by the ending to Lost. People complained not only about the direction of the story, but that it didn’t answer many of the questions and mysteries set forth throughout the series. Many disliked the semi-religious, surprisingly positive and hopeful ending for the series, which had all of the show’s characters, dead or alive, reuniting in a church in order to pass on to the next phase of the afterlife. That a series supposedly built on such intricate, well-researched plot points that practically required a PhD in physics to unravel chose to ignore most of those unresolved questions in favor of a “touchy-feely” “emotional” ending rather than a logical, mind-blowing brain teaser of an ending was insulting to those for whom the mysteries were the show’s driving force. On the other hand, some people, myself included, loved the ending, and while we had enjoyed trying to riddle out the mysteries the same as everyone else we were more invested in the characters and the overarching themes rather than the solutions to the TV version of math equations. So I can’t imagine Lindelof and Jensen are completely surprised with some of the mixed reviews the film has gotten, which I think stem from two different feelings. The first comes from the group of people who watch movies for “plot” rather than “story.” I’ve talked about the difference between the two in other articles, but plot has to do with the who, what, when, where, and how of a series of events, while story is all about the why. You can tell the same plot in a variety of different ways and end up with very different stories. But anyone watching Tomorrowland for plot, hoping to solve the mystery of Tomorrowland, was destined for disappointment. 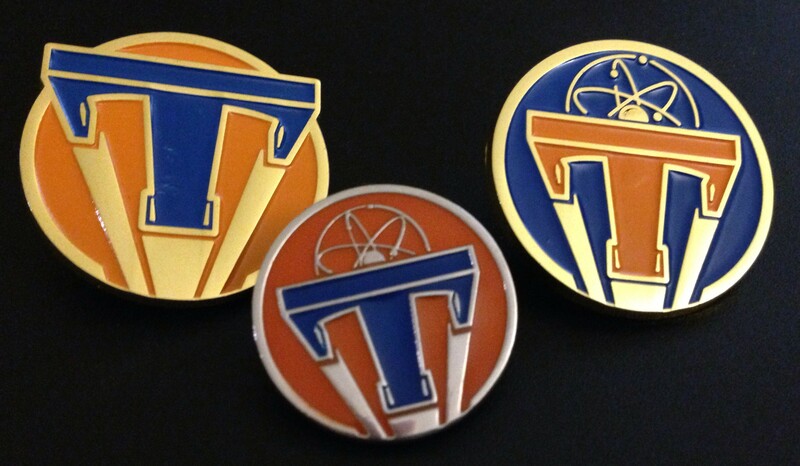 The film was never about solving these mysteries, and Tomorrowland itself is not a place that needs exploring. Many reviews I read focused on the reviewers’ disappointment that Tomorrowland itself played such a small role in the film, and even once the characters arrive very little storytelling energy is devoted to it. This is because Tomorrowland in the context of the film is not a universe to explore, it’s a symbol of everything the movie represents, and as such its effect on the story’s characters and the film’s theme is worth far more than any secrets it holds. We don’t need to see more of Tomorrowland because what it makes us feel is more important than what it actually is. In this respect, the ARG, the prequel novel, and all of the other clues, hints, and explanations can only serve to flesh out the story’s background, but they can’t make it a more meaningful experience. That meaning is the second main source of the complaints I’ve seen. It’s not “cool” any more to have a message in a film. People generally dislike sermons (church attendance has been steadily declining for some time now), and they don’t like to be told what to think or feel. These days, people seek out messages that reinforce beliefs they already hold. Life is easier that way, and you can keep trudging along the path you’re already on, rather than looking around to see other ways. This is doubly true when the message is something that many people would consider “cheesy” or “Disneyfied” or simply not “real” enough. Many people find “hopey, changey stuff” insulting or feel like they’re being lied to. There’s probably another entire article that could be written as to why, but I’m not a psychologist, so I don’t dare get into that. Suffice to say that I know many people who would enjoy Tomorrowland only to be turned off by its message and morals. As with most films, the reactions have largely boiled down to the questions of expectations vs reality. Tomorrowland never pretended to be anything other than what it is, but the very nature of the film industry has colored any new release by quickly putting it in the appropriate box. People like to know what’s coming, which is especially true given today’s spoiler-centric culture, and when a story doesn’t fit with the box it’s been put in people tend to react negatively. But Tomorrowland would suggest that there’s even more going on, and it directly criticizes not only the sorts of stories we frequently consume, but the way in which we experience stories in general, all of which is directly tied into its message. There’s a lot more to Tomorrowland (and optimism in general) than simply the power of positive thinking. We all know the state of the world in which we currently live. David Nix lays it out pretty plainly at the end of the film, how we have simultaneous epidemics of obesity and starvation, bees and butterflies dying, rising sea levels, etc. Casey hears it every day in school, whether it’s history class telling her about mutually assured destruction, science class showing her the melting ice caps, or English class using literature to show how we’re living in a dystopia right now. The key point is that most people seem to have accepted that dystopia to a certain extent, while Casey actively fights against it. When she does she’s either arrested or dismissed. Her teachers find her hopeful question of “Can we fix it?” frustrating, while her peers just laugh dismissively. Even her father, who is supportive of her ideas and enthusiasm, still does his best to try to make her see the “reality” of their situation. It’s not easy in this world to be an optimist. Everything out there will try to beat you down, and everyone will tell you that you can’t make a difference. It’s much easier to accept the world as it is, and not bother trying to change it, just going with the flow. This is Frank’s position. He was an optimist just like Casey, but his life experiences combined with some bitter disappointments led to him giving up. Have you ever been told, “I used to be just like you when I was your age”? It’s one of the most insulting things that someone can say to someone else, because it implies that they are no longer like that because they found a better way. No one would choose to be worse than what they were before, so the fact that they are no longer like you means that they have “grown” beyond your current way of thinking. Frank would probably have said something similar to Casey, although he isn’t given the chance as the story progresses too quickly for it. Tomorrowland in the film is a real place, but it’s more important for what it represents. In many ways, the film is the anti-Atlas Shrugged, the Ayn Rand Objectionist novel/manifesto that is popular these days among American Conservatives and argues against governmental regulation and responsibility to society and in favor of unrestrained capitalism and rational self-interest. It has major parallels: in Rand’s novel the best and brightest leave society to set up their own land where they can operate free from the corrupt government and the looters who hold them back by making demands of what they’ve earned, while in Tomorrowland the best and brightest leave society in order to pursue their dreams free from governments and capitalism who would take their creations and corrupt them from their pure intentions into weapons of destruction or tools of profit. In fact, David Nix might be the ultimate Randian protagonist, except that from Tomorrowland’s frame of reference, he’s the antagonist. Nix is a brilliant mind who believes in allowing others like himself to work without boundaries or expectations. Upon seeing the full extent to which society might destroy itself, and witnessing what he felt was society’s true nature in the way it seemingly embraced the apocalypse, he sealed off Tomorrowland, kicking out those who disagreed with his philosophy and not only leaving the world to its fate but actively working to help bring it about and apparently enjoying what he probably feels society deserves. The fact that he is ultimately undone by optimistic do-gooders who feel like he has an obligation to help humanity would seem like the ending of a Randian tragedy, had she written one, in which the overwhelming force of the “looters” who leech off the accomplishments of the great destroys the very person whose accomplishments they need. But Tomorrowland isn’t an Ayn Rand story. From Plus Ultra’s earliest beginnings, based on the novel, the ARG, and other glimpses, the secret group was created out of a desire to help humankind advance. Tesla, Eiffel, Edison, and Verne imagined a world where their creations could be of the greatest good for all. In Rand’s view of society, it’s the “looters” who hold the great minds back from achieving their true potential by guilting them with the insistence that they’re obligated to help the world. Plus Ultra comes at things from the opposite perspective, with a desire to fulfill their obligation to humanity despite being obstructed by government and corporate interests which argue out of self-interest only in favor of those things which benefit the ones already in power. This ideal, however, is difficult to achieve. In Before Tomorrowland we get to see Plus Ultra in its heyday, but also in a state of internal conflict. The created the atomic bomb in order to punch their way to other dimensions, only to realize after the fact the amount of damage it does to the earth and the amount of power it gives to various nations. Yet at the same time, the rising tide of Hitler and the Nazis mean that a time may come when Plus Ultra has to turn over their dangerous knowledge to less altruistic hands in order to stop a monster. Throughout the book we hear how Howard Hughes is financing the inventions and dreams of Plus Ultra, including its recruitment efforts and the building of the city of Tomorrowland, but while he understands their goals he’s also frequently lamenting the fact that their inventions aren’t bringing in any money, either because they’re not ready for release to the public or because they’re not of functional, profit-making use. Even the most idealistic vision still requires funding in our world, a fact that Plus Ultra seemingly struggled with throughout its history. David Nix continues this dichotomy. When young Frank Walker brings his homemade jetpack to the World’s Fair in hopes of winning the $50 prize, Nix grills him on his invention. He first dismisses it when Frank admits that it doesn’t completely work, but he’s even more questioning about what its usefulness would be. Nix dismisses Frank’s assertion that flying around would be fun, but then Frank gives an impassioned description of what it would be like to watch someone fly through the sky. I’d make the person on the ground believe anything is possible, and it would inspire them. Nix is momentarily sold, but still dismisses Frank. Athena, however, having been programmed with the ideals of Plus Ultra and free from the corrupting influence of the world, sees in Frank the very embodiment of Plus Ultra’s ideals, giving him a pin and recruiting him for the team. Casey understands this as well. The Launchpad whose demolition she’s sabotaging is more than just the place where they launch rockets, it’s a symbol. It represents humanity’s dream to strive for the stars, the idea of endless possibilities. I’ve often heard friends on both sides of the political divide argue for the disbanding of NASA, saying it’s too expensive and provides no benefit. Beyond the fact that both of those assertions are patently untrue, NASA represents the best part of our nature, the part that knows we can break through barriers and achieve the impossible. Space exploration (and other space exploration programs around the world) value lies as much in its ability to inspire as in the genuine advances to our society it has helped usher in. It certainly inspired me to be an engineer, and while that may not have been a huge success I’m sure there are countless others who have gone on to do more for society thanks to that inspiration than I ever will. It’s easy to see why Casey’s strongest connection to Tomorrowland came from the rockets heading into space in her vision. But symbols can be corrupted too, look at the nature of today’s entertainment. All movies are inherently symbols to a certain extent, and we now live in a world where Superman helps destroy Metropolis putting millions of people at risk and defeats the villain by snapping his neck. And then there’s Star Trek, a vision near and dear to my heart, which has been corrupted beyond recognition (partly by one of the writers of Tomorrowland, in fact) in the recent reboot. Star Trek was the Plus Ultra of the future, giving us a world where phrases like “we work to better ourselves and the rest of humanity” are commonplace, the characters live in a socialist society, and they literally made a feature film about saving the whales. But all of those ideals are gone in the recent takes on these stories. You often hear that heroes and idealistic symbols are boring. Star Trek: The Next Generation was followed by the darker Deep Space Nine, where good characters sometimes had to do bad things in the name of accomplishing the right ends. Buffy the Vampire Slayer was followed by Angel, an equally darker show. Tortured anti-heroes are all the rage, and formerly popular ideas, shows, and characters are rejected for being “too moral.” I’m sure there are entire research papers and theses on this phenomenon, but Tomorrowland gives some very clear answers as to why. And that’s not to say that apocalyptic stories have no place, they can be equally as inspirational as standard good vs evil fables, as the heroes in darker stories have more hardships to overcome and can be more relatable. But when we start fetishizing the apocalypse, and it becomes something to embrace rather than avoid, that’s when hope starts to fade. In the film, Nix used the Monitor to pump subliminal images of Earth’s destruction across the planet, in the hope that humanity would be frightened into action and would join together to make things right. “In every moment there is the possibility of a better future,” Nix says, but in actuality humanity embraced these images, “wrapping” themselves in the apocalypse. Why? “Because that future doesn’t demand anything of you today.” It’s probably the most important line in the film, and as usual the clear moment of truth is delivered by the film’s villain. It’s also pretty accusatory of the audience, rightly pointing out that we are to blame for our current predicament. Being an optimist is hard, and it often doesn’t feel good. Ayn Rand’s “heroic” character John Galt was described in Atlas Shrugged as a man who looked as if he’d “never known pain or fear or guilt.” An optimist, on the other hand, feels these things all of the time. We feel pain through empathy in the suffering of others, no matter how nice our lives might be. We fear for the future and thus want to make it better. And we feel guilt over every moment that passes in which things get worse. An optimist literally can’t accept things as they are, because this pain, fear, and guilt would simply overpower them. Everyone has these sorts of feelings within themselves, they’re a part of human nature, but as Tomorrowland suggests it’s easier to silence those feelings if we embrace the apocalypse. If we convince ourselves that the world is going to hell and there’s nothing we can do about it, then we don’t feel bad for doing nothing, and nothing gets better. It’s often easier to give up than it is to keep fighting, and I’m sure we all have had moments where we had to choose between one wolf and the other. “There are two wolves and they’re always fighting. One is darkness and despair, the other is light and hope. Which one wins? Whichever one you feed.” We all have this battle raging inside of us. The dark wolf in Nix won the fight. The dark wolf in Frank Walker almost won the fight, only for Casey to come along at the right moment to feed the light wolf. We all have choices in life, and sometimes something as simple as the symbols with which you surround yourself can make all the difference. And if something can inspire you to be an optimist, you never know whom you might inspire in turn to look at things differently. Maybe your inspiration is a man in a jetpack, maybe it’s a rocket headed to Mars, or perhaps it’s simply a film all about possibilities. I said in my review that Tomorrowland is not a movie for everyone, and that’s somewhat true. I don’t mean that it’s a movie that some people should skip, but that it’s a movie with a message that not everyone will be willing to hear. But it spoke to me. I’ve spent large portions of my life being embarrassed by who I am, and by my attitude towards things in general. Being an optimist means having a certain level of enthusiasm which is hard to fake and harder to suppress. I get extremely emotionally attached to things, which is at odds with a society in which detachment and cynicism are the norm. So for a movie to celebrate and advocate for people who think and feel the way I do is more important to me than I can fully express. The moment that hit home the hardest for me was a quick, throwaway piece of an exciting scene. I immediately identified with Casey Newton, as she felt like a twin sister to me. Her eager, inquisitive attitude, her eternal optimism, and her willingness to risk everything to change things for the better all hit home in a very personal way (though I’m not nearly so brave). I internally cheered when she asked Frank, “Don’t we, like, make our own destiny and stuff?” and the monitors flickered and the percent chance of the apocalypse dropped ever so slightly. But what really sold it for me was when she boarded the Plus Ultra rocket ship at the Eiffel tower and it finally lifted off. She was living her dream in that one moment, and she screamed with joy, completely overcome by the experience and the emotion of the moment. I’ve felt like that many times in my life, and it’s typically a feeling that has to be hidden to a certain extent. People tend to give you weird looks when you scream for joy or cry from being overwhelmed with emotion, even people who know you better than anyone else, so you bottle that feeling up until you’re alone and can let it out without being judged. Tomorrowland is a movie that showed it’s not only acceptable for me to be who I am, but it might even be a good thing. It’s a movie that seems like it came out of my own head. It gave voice to many of the frustrations I have with the world around me (“Do I have to explain everything? Can’t you just be amazed?”), but also all of the joy there is still to be found and the hope for the future that sustains me. I know I’m not alone in these feelings, but it feels like I am so often that it’s easy to forget that there are other optimists out there. But it’s not just me and my craziness that Tomorrowland speaks to, it connects to many people’s real world experience as well. Writer Jeff Jensen lost his wife last year to brain cancer, and I can’t imagine it’s any coincidence that Clara Brackett, one of the protagonists of Before Tomorrowland, also suffers from a similar condition. In the book, she’s given a set of 3D glasses that actually show her a vision of Tomorrowland, similar to Casey’s pin, as part of the planned recruitment activity at the 1939 World’s Fair. The recruitment was canceled due to the Nazi threat, but only after she received the glasses. The glasses lead her to a demonstration room set up by Plus Ultra, which offers a look at the possibilities Tomorrowland represents if Plus Ultra’s dream is realized, and among the booths is a possible example of future medicine, which might cure her disease. Later when she falls in with the real Plus Ultra, she asks if that technology actually exists, and is disappointed to learn that it doesn’t. I can’t imagine how it would feel to lose your spouse to something like brain cancer, but I feel like there are certain feelings we all can relate to which play out in the overarching story of Tomorrowland. There’s a massive amount of frustration at the world we live in for suppressing advancement for a variety of reasons mostly selfish in nature. It’s easy to think that we’d have a cure for cancer by now, along with many inventions and discoveries the world needs, if the world would stop getting in its own way long enough to expend every possible effort. That comes with a healthy dose of anger at those around you and at yourself for not doing more to make an idealistic place like Tomorrowland, where there are no limits to imagination and invention, a reality. But there’s still that wolf of light and hope, telling you that there’s still a possibility, even if it seems like 0.06% of a chance, that we can change the world with even the teeniest of actions if only we don’t give up and refuse to accept the way things are. That’s the wolf that gets me out of bed in the morning, and it’s the one I try to feed as much as I can. It seems in evitable that Tomorrowland was made by Disney, the very company whose idealistic worldview so often makes it the target of cynics and haters. I’ve discussed the Disney ideology at length in my analysis of Saving Mr. Banks, so I won’t repeat myself here, except to say that Tomorrowland seems like the perfect companion to that film. Walt loved the promise of the future, but he was fully aware of the reality of the world we lived in. But he believed that it was important to show the world that there were better options out there, and that hope can be found in even the darkest of situations. Disneyland and Disney World are dedicated to “the ideals, the dreams, and the hard facts” of the world, “with the hope that it will be a source of joy and inspiration to all the world.” The Disney parks are a real life Tomorrowland here on the planet. They’re about feeding the right wolf, showing that there’s a different way to look at things. They’re a symbol, just like a jetpack, a rocket, a pin, or even a movie. Any movie that can play that song without irony has earned my respect and admiration. And there are a million more things I could discuss about the film, particularly about the almost unheard of diversity of the film’s final sequence, but also about the film’s strong female characters, its connection to Cinderella‘s message of “have courage and be kind,” or simply rant about the way people watch movies these days, but we all know I can drone on about movies for far too long and I’ve probably rambled on enough already. 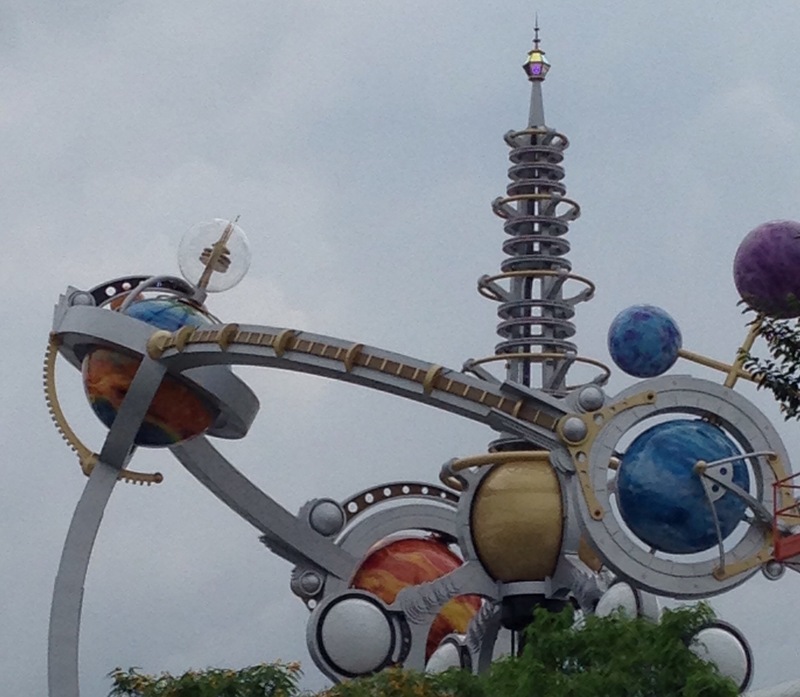 Tomorrowland may not be the huge success that Disney or its creators envisioned, but it meant the world to me. And I suspect, if you’re ready, it could mean something to you too. This entry was posted in Movie Analysis and tagged "its a small world", Atlas Shrugged, before tomorrowland, brad bird, carousel of progress, Casey Newton, damon lindelof, Disney, Disney World, Film, Film Analysis, Frank Walker, jeff jensen, Lost, Movie Analysis, Movies, plus ultra, Star Trek, The Optimist, Tomorrowland, Walt Disney World, WDW by lovepirate77. Bookmark the permalink. Interesting view. I haven’t really seen Tomorrowland, though I know the story, and I’m a bit too sardonic from my family and friends to consider myself an optimist, but I do understand the concept of enjoying things that are not necessarily loved but still give me inspiration. In terms of optimism, I understand the emphasis in wanting “gritty” or “realistic” depictions over something that offers the best of humanity. Still, in a way, the grittier, dystopia films cannot possibly exist without a contrast or even a concept of an ideal or optimistic life. If the grimmer views of life were truly the “real” points of life and thinking, then nothing would truly be of value. Without hope, there would be no need to argue for the darker perspective because the argument itself would be pointless. In essence, we need such perspectives as those from Tomorrowland because they are what keep both styles alive. Even if, against all odds, this feeling of optimism isn’t an ideal mindset, which I’ve already implied that it is, it still has every legitimate right to exist. One of my own favorite quotes (which of all places comes from a 1970’s sitcom) is a line that reads “Nothing needs less justification than making others happy.” In any case, the optimistic message movie such as Tomorrowland has every right to be made and seen just as a classic as Citizen Kane if it can satisfy and inspire viewers like me and you. It’s kind of nice because it implies a selfless exchange when neither side truly loses anything when legacy, legitimacy, or the concept of “realism” don’t have to play a role. Only time can tell the project’s true contribution to society and its people, but that doesn’t mean it was never significant at one point in someone’s life. I’m sorry to get all philosophical with this, but it’s still an interesting topic to me. I’m glad you’ve brought it up, and you describe it perfectly. Keep up the good work. Hi, and thanks for reading and taking the time to comment. I completely agree with you that dystopian films and stories can’t (or at least shouldn’t) exist without the contrast of films focused on hope and optimism. If all we are exposed to are dystopian narratives, we start to believe that’s realty rather than one example of an extreme (which is the premise of the ending of Tomorrowland, where we’ve been subjected to nothing but dystopia and thus have embraced it as a “real” version of the future, making it a self fulfilling prophecy). I’m really glad that while you don’t consider yourself an optimist, you’re accepting of the existence and even the need for films like Tomorrowland. Too many people I know who would object to being called an optimist reject any films that offer a viewpoint like Tomorrowland, dismissing their very existence because they don’t match their worldview. It’s the equivalent of someone with a particular political viewpoint only reading or watching news devoted to supporting that viewpoint, reinforcing what they already believe. I’m an optimist but I love dystopian stories, for the varied perspective they offer and as a balance to more optimistic films. There’s a very clear divide between Marvel and DC films these days, and I personally feel that the Marvel films are more balanced than Man of Steel or the Nolan Batman movies. I absolutely love the scene when Stark saves the people falling from Air Force One, it’s the perfect example of what superheroes are supposed to represent, triumph over overwhelming odds. Man of Steel was an interesting film, but I felt like it lost focus at the end and didn’t really know what it was trying to say with its story. It certainly felt like it had little connection to the Superman character with decades of history, but it was also just uninteresting to watch. CG destruction no longer impresses me; it needs to make me feel something or have some relevance or commentary too it. You’re exactly right. I’ve never understood why some people get so offended by optimists. I presume, based on conversations, that they feel optimists are ignoring the reality of the world, looking at things through rose colored glasses, which is of course not true. I love your quote of “Nothing needs less justification than making others happy.” I’ll have to find a way to work that into my mental database of quotes to use. There have been a number of people online who were just as inspired by Tomorrowland as I was, so I think the filmmakers should consider it a success, even if it doesn’t measure up at the box office. In fact, the message of Tomorrowland is that even the tiniest of actions can change the world, so inspiring people with your film can certainly make a difference. Don’t ever apologize for getting philosophical! I love a little philosophy around here, and if smart, interesting people like you don’t bother to comment then I’m just sitting around here talking to myself. I’m glad you enjoyed the article and were interested in the topic, and I really appreciate you taking the time to stop by! This review for me was spot on. I enjoyed the read. And I really do love this movie and pre-book. It has been a driving force for homeschooling my kids this year. I want them to be the dreamers. Be the change. Thanks for such a well written piece. Thank you so much! I’m glad I’m not the only Optimist out there, and that the movie means as much to others as it does to me. I’m really happy you’re trying to encourage your kids to be dreamers, I wish more people would. Thanks for stopping by, reading, and taking the time to comment! It means so much to me! Me too. This is my favourite film. Let me share just some ideas with you, from dreamer to dreamer. I think there are some keys to help fix this world and empower the dreamers. One is Basic Income http://basicincome.org/ and the other one is “a tower” to teach the world to feed the good wolf and to let them build the Basic Income without permission of governments or companies. Why I think this way? Because there are people that have created technology that can works to do it. And because if everybody has the basic money to not be poor and to say NO to the garbage jobs to let them create their dreams, that’s the step that all we needs to be optimists. One technology is Blockchain, and ideas like FairCoin to start walking on that direction, and the other is WebTorrent, Kodi and Raspberry Pi, to let people not just create their own vídeos to make their own TV Channels, but to bring people the Basic Income idea to build it cooperating together and to let people get out of the competitive way of think. Thanks for your words, that kind of words feed my dreams and my heart. Just realized this was made four years ago. Not sure if you’ll even see this. A movie that ignites the soul. Glad hear your words and meet you. It’s great to meet someone like you! Thank you for this!